The trials of trying to get a new book published do not grow easier, sadly. This is an article by a friend of mine about her latest book … and the things that can go wrong! It’s a thriller: ALL YOUR SECRETS. Much like my other thrillers, this is a full-length psychological thriller, with a twisty page-turning plot and a strong local atmosphere. Apparently the setting wasn’t what my publisher wanted. My other two thrillers were set in Cornwall. They wanted a thriller set in London. This new book is set in the gorgeous South of France, a place I have visited many times and with which I have a natural affinity. Last summer, I submitted two synopses and a 25,000 word sample of my South of France thriller to my publisher. Following a miscommunication of some kind, I mistakenly thought my editor was excited by the sample I’d sent and was planning to acquire the book. Some months passed while I knuckled down and finished the book before my contract arrived. (Which is something many full-time writers end up doing, working on a book before the contract arrives.) I loved every minute of it though; it was a delightfully tactile, sensual book to write, and deeply sinister too. In December, a few thousand words shy of finishing ALL YOUR SECRETS, I asked again about the contract. It was only at this point that I discovered my publisher did not want the book. However, I received a contract for the other synopsis. The book I had not written. With only 8 weeks in which to write it, apparently. I did the only thing I could. I wrote the new book. And I did it within the required 8 weeks. It’s currently at copyedit stage and will be published in January 2018. Bizarrely, this is not unusual in publishing. It’s the kind of thing that happens to writers all the time. Talented writers. Hard-working writers. Established writers. Full-time writers with bills to pay and no other way to pay them but through their own skill with a keyboard. Most established writers can tell publishing stories to make your toes curl. Trilogies that flop and are abandoned as a lost cause, leaving one or even two books unpublished. Novels that are commissioned in conversation – like my own bestselling thriller, GIRL NUMBER ONE – and then rejected later, leaving a writer stuck with a book written to a very specific brief that they now need to sell elsewhere. Not always easy. So two years after I was forced to self-publish GIRL NUMBER ONE (a book rejected by over a dozen publishers, mind you, which subsequently sold 50,000 copies in a few months as a self-published title, hitting #1 in the UK Kindle Chart), I found myself with yet another unwanted novel on my hands. You’d think I’d have learned my lesson by now. But hope springs eternal! This time, I was not contractually permitted to offer it to another publisher – not under the name Jane Holland, at any rate, which has become my ‘thriller’ name. However, I was given permission to self-publish ALL YOUR SECRETS. When the going gets tough in this industry, the tough often end up having to self-publish. Not the most ideal situation, especially when a book has been written with a rather different arena in mind. But I have three children to feed and clothe, and this book took about 4-5 months to write and edit – an expensive time investment for me – so heigh-ho, self-publishing it was. I proofed the book, made a cover, wrote a blurb, and started telling the poor, long-suffering souls on Twitter that my book was about to go live. I had a pleasing number of pre-order sales. Those are my fans, and I thank them wholeheartedly for sticking with me! A self-published novel that isn’t priced at 99p – instead, it’s a modest £1.99 – is not the easiest thing in the world to persuade random punters to buy. Nor do I have the surprise of writing in a new genre to help me, as I did with GIRL NUMBER ONE. So any sales you can waft my way will be hugely appreciated. This book has been written with all my skill and knowledge behind it, the experience of writing several dozen novels, and I feel certain many thriller-reading people will find pleasure in it. I thank you all in advance for any retweets or Facebook shares or reviews or other promotional help you can offer this new and highly atmospheric book-baby of mine … The blurb follows. What happens when love is perfect? Too perfect? When her glamorous cousin Emily drowns, Caitlin flies to the South of France for her funeral, full of bitter-sweet nostalgia for the summer they spent there as wild teenagers. Her aunt Tamsin, once a film star, now suffering from dementia, invites Caitlin to stay at her chateau high above the beach at Cap d’Antibes. Suddenly the gorgeous, charming Robin is back in touch, son of a Hollywood film producer. Tamsin warns her to stay away from him, but Caitlin can’t resist her teenage crush. Soon the pair are falling madly, deeply in love … all over again. But something doesn’t feel right. What was Robin’s relationship with her beautiful cousin? And what is her aunt trying so desperately to conceal? The chateau on the Cap may be beautiful, but it hides dark secrets. Was Emily’s death an accident? Or could it have been murder? 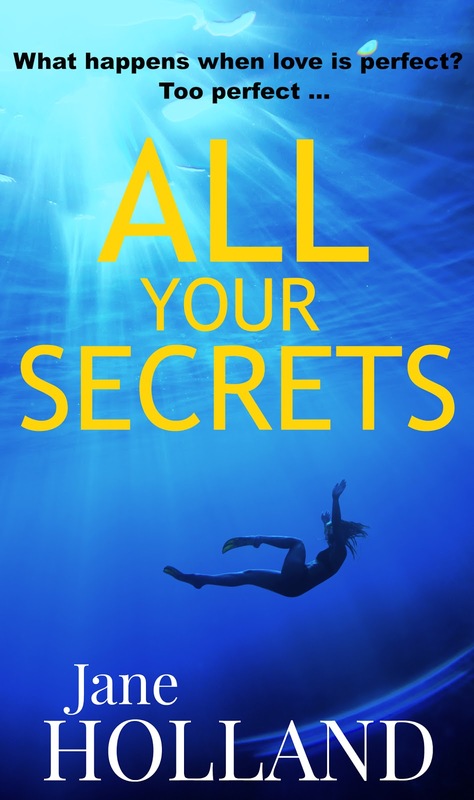 — ALL YOUR SECRETS is an atmospheric psychological thriller that simmers with tension and will keep you guessing, from the bestselling author of GIRL NUMBER ONE and LOCK THE DOOR. This article is SOOOOO timely! Thanks for sharing it, Michael. This comes during a week when I’ve been wringing my hands over the publishing industry, preparing to release novel number 2 as a self-published author who couldn’t find an agent. I was venting with my author-mentor Sharon earlier this week about how I wish I could get my titles in with even a small independent publisher, not even to make money but simply to get the visibility of a broader distribution. But alas, my brain knows how the industry works, and this story is a perfect example of what I know to be true. So in the meantime, I write because I can’t NOT write, and because my stories would explode inside me if I left them there. Fortunately I don’t have to use my earnings to put food on the table. Jane, your book looks FABULOUS, and for the love of indie authors everywhere, I’m off to buy it. If we don’t support each other, who will? Best of luck to you! I’ll be cheering for your success! It just goes to show that you are a really kind and generous person, Stephanie. Thanks for the comment, and still more for the offer to buy a copy of Jane’s book. I know she’ll be really grateful for your words (it does look a fabulous book, doesn’t it?). All very best of luck with your own latest. I’m sure you’ll get lucky soon. Let me have details of it, and I’ll promote it on my site for you. I’m happy to do it. Have already made the purchase, and will probably start on it tonight! I have been reading through the books put out by others in my connected world of indie authors, and I am astounded at the amazing talent. It’s just too bad more of the reading public pushes aside indie authors so easily. I don’t blame them, really. It’s from a lack of knowing better rather than animus. It’s only been within the last six years that I’ve learned how publishing works, otherwise I used to be the same way! Now I know that there is brilliant talent to be found in both the traditionally published and indie worlds, and pros and cons in going either route. The grass just always looks greener on the other side of the fence, doesn’t it? Thanks too, for your generous and gracious offer. I thought I might have had your email once, but I’m not sure (I’ll have to look). Contact you through your website as the best way perhaps? I could also Twitter DM you, but maybe you don’t check those. Just let me know your preference. Thanks so very much, Stephanie! How lovely of you to buy my book. I sincerely hope you’ll enjoy it. And thank you so much, Michael, for hosting this blog post. I agree that things are getting tougher all round in publishing, and I’m not sure where it will all end or what writers like us should do for the best. But we want readers, we need readers, or else what is it for? And if self-publishing is the only way to guarantee at least a few readers, then that’s where we need to go. Good luck! Good luck to you with your new book too, Jane. Hope it sells in bucket loads!